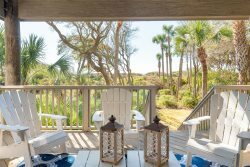 Centrally located on Kiawah Island, 5014 Turtle Point is a gorgeous 3 bedroom, 3 bathroom condo. Fully renovated and a short walk to the beach, this property is surrounded by the lush nature and beauty that Kiawah is known for. It is situated on the 17th tee and fairway of the Turtle Point Golf Course, and is just minutes away from the Sanctuary Hotel, Night Heron Park, and more. The desirable open layout of the first floor consists of beautiful hardwood flooring, an abundance of windows, and bright coastal décor. All of these things enhance the natural light of space and give the home a warm and inviting feel. The main living room has a mounted flat-screen TV, seating for 7 guests, and is open to the kitchen and dining areas. From this area, you can access the private balcony deck to enjoy a cup of coffee while overlooking the lagoon and golf course. The dining room, which is part of the main living space, has a large wood table with seating for 8 guests. If entertaining a larger group, there are 4 barstools at the kitchen counter for additional seating. Open the French doors off the dining area to relax or read a book in the additional sunroom with a sofa and TV. The fully-equipped kitchen boasts new appliances, granite countertops, and maple wood cabinetry. This level of the home makes it easy to whip up a delicious meal and enjoy spending times with friends and family. There are two bedrooms on the first floor, each with a private bathroom and TVs with DVD and Netflix capabilities (no cable channels). One bedroom has a King bed and the other bedroom has two twin beds. The king bedroom on this floor also has a private balcony access. The spacious master suite is on the second floor of the condo and features a private balcony. The master bathroom has been fully upgraded with granite countertops, a Jacuzzi tub, and vaulted ceilings to bring in the natural light. It is an ideal retreat after a long day at the beach. Come see why 5014 Turtle Point is the perfect island getaway! Great experience- first time using you all! Friendly and efficient with good follow up. We really enjoyed our stay at 5014 Turtle Point. The villa is decorated well and was perfect for us. Nice to have the "porch" area screens in so the kids could watch TV in a different area than the adults. Close walk to the beach!